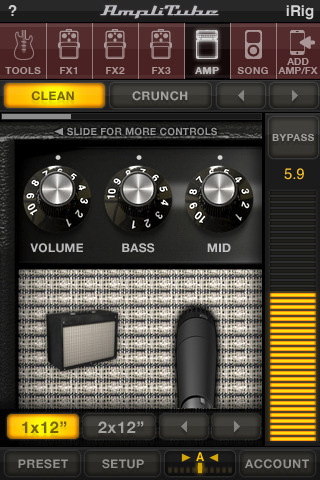 AmpliTube is an iPhone app from IK Multimedia that when connected with the iRig device (sold seperately) turns your iPhone into a guitar effects processor that can emulate sounds and effects from a variety of Stomps, Amps, Cabinets, and Mics. Combining software and hardware, using your iPhone and electric guitar or bass, you can now jam away in the privacy of your own headphones anywhere you like. First things first, order the iRig device from the IK Multimedia web store. Once you get your hands on iRig, download the AmpliTube app on your iPhone and open it up. Plug your guitar/bass into the iRig, and the iRig to your iPhone. From there connect a headphone to the output slot on iRig to hear the sound. You can use the white Apple headphones but don’t use iPhone headphones, since the microphone in those will pick up feedback. Just find some plain headphones, or you can also connect iRig to amplified speakers for live performance. Now that you’re all hooked up it’s time to play with AmpliTube. First off when you open AmpliTube you have to setup an account with IK Multimedia to use it. The iPhone version of Amplitube is divided up into 7 tabs on top and 4 buttons on the bottom. From the top of the app you can jump between Tools, FX1, FX2, FX3, AMP, SONG and the Store. On the bottom the buttons take you to AmpliTube’s Presets, Setup, the Tuner and your Account. There are 5 amplifiers in your iRig/AmpliTube setup listed below. Each Amp has 5 speaker cabinet configurations in itself (1×12” 2×12” 4x12A” 4x12B” 1×15”) and 2 mic setups (dynamic and condenser) to choose from. In the Tools section you’ll find a chromatic digital Tuner, a handy tool for fine tuning your guitar/bass. There is also a metronome for honing your timing, and it has a way to change its BPM using a slider or by tapping. Finally here you can listen to 8 demo tracks recorded using AmpliTube for inspiration. Latency: (Ultra-Low/Low) is a processor generated micro-delay. Use it to adjust the difference between what you play and what you hear. No Feedback: (On/Off) will disable high pitch constant notes in headphones. Auto Sleep: (On/Off) is disabled by default. Turn it on to save battery but if you hear clicks and pops during playback, turn it off. The Song tab lets you import your own music files into AmpliTube so you can jam to them. To do this you have to use a computer that’s connected to the same Wifi station as your iPhone. Then you get a URL that you go to on your PC to upload the songs one by one. You can set loop points in imported songs so you can easily practice specific parts of a song. You can also adjust the volume to better hear your own playing while the music plays. Presets are saved settings with various combination of AMP/FX choices that you can jump between quickly. AmpliTube for iPhone comes with 9 pre-made presets and you can create up to 36 total. Tap and hold any number to create new presets or delete existing ones. There is an 8 page help section that explains how to use the app with a link to the website with a full manual. You might find iRig in your local Guitar Center and avoid paying the shipping fee. When you order from IK Multimedia you do get an awesome GrooveMaker T-Shirt for free however. There is no way to record/share your playback sessions as of now, which would make this app even more complete. 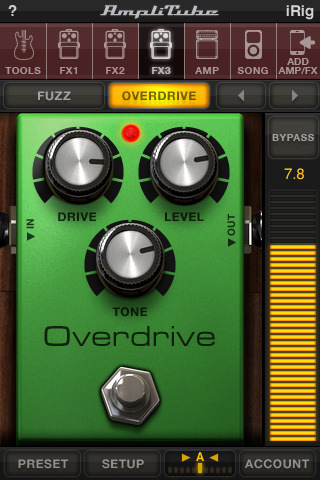 Moving through the effects and amps on the iPhone is a little tedious. It might help if the interface allowed for swiping instead of tapping navigational buttons. In my case unfortunately the iRig cable did not fit in the iPhone 4 headphone jack without removing the Apple bumper case, so I have to remove the bumper to use iRig. The app doesn’t currently run in the background using iOS 4. Messages that popup when you open the app can get annoying. A message warns about the volume levels which is good to have but please make this go away after the user has seen it a few times. Once in a while there are also alerts about downloading other apps from IK Multimedia. After you register the app, the account button stays there but doesn’t really do anything other than alert a message saying “AmpliTube is already registered.” It would be nice if it showed the user’s page or maybe was removed all together. Overall, iRig/AmpliTube for iPhone is a solid accessory that is a must have for any guitar/bass player. You’ll be able to practice in the privacy of your own headphones using industry leading studio effects for a relatively low price. AppSafari review of AmpliTube was written by Joe Seifi on July 25th, 2010 and categorized under Accessories, App Store, Featured, Fun, Music, Utilities. Page viewed 5289 times, 2 so far today. Need help on using these apps? Please read the Help Page.